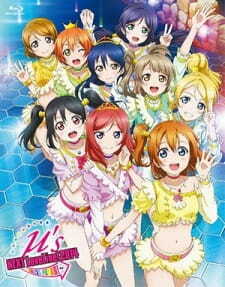 Japanese: ラブライブ School idol project！μ's→NEXT LoveLive！2014～ENDLESS PARADE～アンコールアニメーション 0209Ver. Pretty much a short video with all nine members doing something that anyone who is a fan of them will enjoy. Not much else to this video. Think of it as a small treat or "thank you" for buying the LIVE blu-ray. There is no story to this, its just an "encore" video. They interact with each other in the beginning, and then each member has a "solo" screen time where they say something. Sound, art, and character are what you would expect from the two seasons, which is nice for consistency. To be honest, the main reason I gave this a 9 is because of Umi's phrase. That alone made this video almost near perfect. Anyone who is a fan of Love Live will enjoy this and will not be let down. Go watch it!